Raised in the Hudson Valley, with childhood summers in Kentucky’s Appalachian Mountains, Eric Rhein formed a deep affinity with nature—an ongoing inspiration for his work. Rhein’s art—which includes wire drawings, sculpture, mixed media collage, and photography—features a wide iconography shaped by the natural environment: hummingbirds, leaves, deer, and other organic forms. Frequently employing salvaged materials as varied as wire, pages from vintage scientific journals, hardware and jewelry, Rhein imbues these cast-off materials with new life, mirroring his own path as experienced through his evolving relationship with HIV. A presence in the East Village arts community since 1980 (with fellow artists Greer Lankton, Huck Snyder, Luis Frangella, David Wojnarowicz, Keith Haring, Robert Mapplethorpe, Peter Hujar, Hugh Steers, and Mark Morrisroe—most of whom are in the Visual AIDS Archive), Rhein experienced not only the community’s creative explosion, and also its profound devastation due to the AIDS epidemic. Diagnosed HIV positive in 1987, Rhein felt compelled to address universal aspects of the human condition. His series of photographic and sculptural self-portraits, starting in 1991, trace the fluctuations, vulnerability, and resilience of body and spirit. Primarily nudes, these images softly convey a range of experiences and emotions. There is sensuality within in these works—which embrace acceptance, loss, and remembrance—and survival and faith. Portraits of intimate friends, commenced in the 1990’s, compliment this series. Rhein’s rough and tender marker and mixed-media Hospital Drawings (made during his 1994 “artist-in-residency” at St. Vincent’s Hospital)—as with the whole body of his work—examine the permeable spaces between life and death, the tangible and the ephemeral, and the known and ethereal. Reflecting his metaphysical and spiritual approach to healing, Rhein’s art depicts our collective vulnerability, resilience, and possibilities for transcendence. Following in the footsteps of his uncle Elijah “Lige” Clarke (an early gay rights activist who, with his partner Jack Nichols, co-founded the first national gay weekly newspaper Gay and the Washington Mattachine Society), Rhein relates to his art as a form of activism. In 1994, David Hirsch invited Rhein to a gathering in artist Frank Moore’s loft, where they founded Visual AIDS’ Frank Moore Archive Project, providing support to artists living with HIV/AIDS and protecting the legacies of those who passed. Reviews of Rhein’s work have appeared in numerous publications, including The New York Times, ArtNews, and Art In America. Rhein has received multiple grants and fellowships, including: the Pollock/Krasner Foundation, Art Matters, Edward Albee’s “The Barn,” and the MacDowell Colony. He is included in the Smithsonian Archives of American Art's "Visual Arts & the AIDS Epidemic Oral History Project”, in which participants are interviewed, in-depth, creating a comprehensive view of their life and work within the context of AIDS. 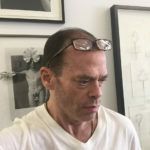 In 2017 Eric Rhein received Visual AIDS’Vanguard Award for his contributions to AIDS awareness through artwork and activism. This has special meaning for him: Visual AIDS has been a vital part of his life since the mid-90’s.